Fernhill stair parts from Pear Stairs, the online stair company. This exceptional range is available in a choice of timbers and designs, making it ideal for building new stairs or renovating old ones. These stair parts would easily transform any hallway into an impressive focal point for your entire home. These parts are half newel caps in the mushroom style. 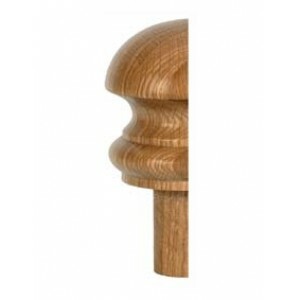 A half newel cap is used to finish a half newel post with a decorative feature. The mushroom cap is subtle but elegant with a smooth tactile appearance.